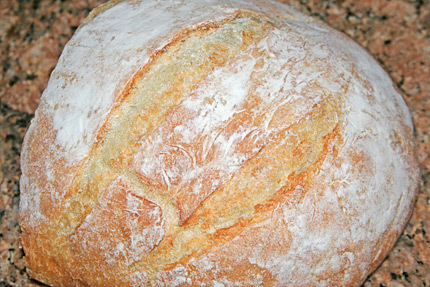 A simple, classic white bread, perfect for the Dutch-oven baking method. This core recipe is the basis for many of my bread variations. The dough should form a sticky ball after a minute of mixing. In a mixer the dough should be moist enough to stick to the sides and bottom of the mixer bowl, but should still mostly form a sticky ball on the dough hook, not a heavy batter or a smooth-surfaced ball entirely stuck to the bread hook of the mixer. Add beer in .25 cup increments if the dough seems too dry. Add .25 cup flour if it seems to runny and batter-like. Spray Pam into a stainless steel bowl, and scoop the dough into the bowl. Cover loosely with plastic wrap and set aside for 2 hours.